Soybean, a kind of legume, is somewhat controversial, and there are many different theories regarding the pros and cons of consuming Soy and its products. 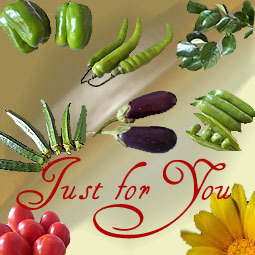 Traditional Indian cuisine seldom made use of fermented Soy products and its only since past few years, that Soy products are used in form of tempeh, tofu, soy milk, Soya sauce etc thanks to the food going global. Probably the only way that Sindhis used Soy was in form of Textured vegetable protein (TVP, or Nutrella, also known as Soyabean wadhi/ badi, and soyabean nandi or granules). Soybean as beans, often known as “meat without bones”, was probably never used, though now the trend is changing and Sindhis too are fine tuning their taste buds to develop a liking for flavors and textures of tofu, tempeh, Soy milk etc. 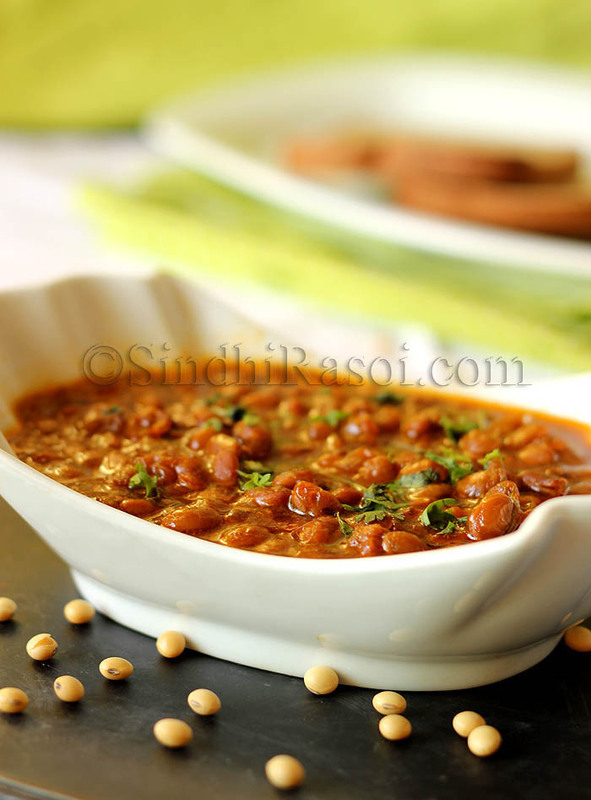 So the protein rich Soybeans, dressed in Sindhi avatar, is dish of the day! Pick, rinse several times with water and soak soybean in water for 6-8 hours. Later discard the water if it is frothy and rinse 1-2 times again. Pressure cook soybean with double the quantity of water and some salt, for 5- 6 whistles or lower the flame after first whistle (the pressure released for once), and cook for 10 minutes.Empty the pressure cooker, reserving the liquid in which beans were boiled. Now using same pressure cooker add 1 tbsp of oil and add chopped onions. Cook on medium flame till light golden colour. Add chopped tomatoes,finely chopped ginger, green chillies, turmeric powder, coriander powder and garam masala powder. 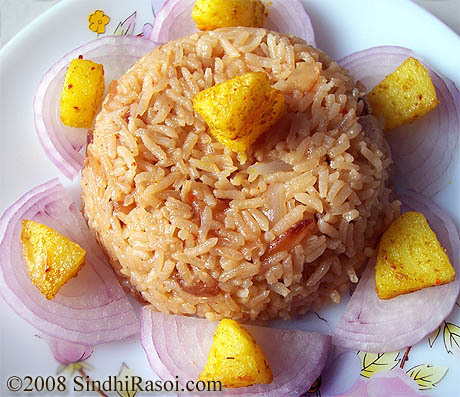 Cook till tomato get soft, then add about 1- ¼ cup of water and close the lid of pressure cooker and wait for 3 whistles. Put off the gas and let the pressure subside. Add cooked beans, adjust salt and mix properly. Add the reserved liquid and again close the lid and wait for 2-4 whistles or until done. Adjust the consistency of gravy and serve it garnished with coriander leaves. 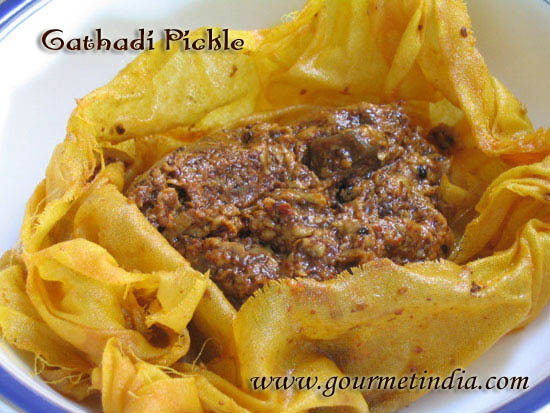 This curry goes well with white steamed rice, rotis, bread etc. Lovely recipe didi. Loved it. 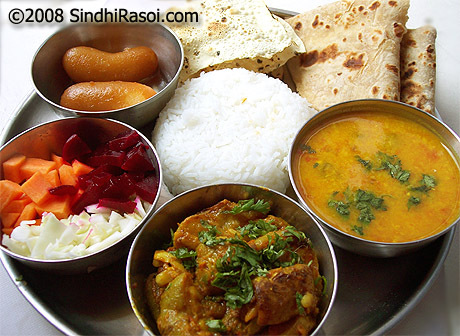 Plz do post more sindhi recipes. Awesome. …it’s was sooooo yum …pls do share more authentic sindhi style recipe..
Isn’t the picture of peas or Rajma in this recipe? I don’t see Soybean in this photo. I love your cooking overall! This look delicious Alka! Would you suggest using the same recipe for black eyed peas (chawli dried beans)?